Completing the box project and getting some much needed publicity was followed by the excitement of a new project. I settled on a coffee table. Design inspiration this time came from Origami. I played around with bits of paper for ages, looking for a concept that could work as a low table. The design is strikingly simple, but in reality quite a complex build. The design brief this time was for the table to resemble a folded piece of paper. The drama in this piece was to be a deep v section or valley that ran across the centre of the table. I chose crown cut English Ash not only beautifully figured but with a textured grain to match. When viewed from above the shape of the table is a perfect rectangle. 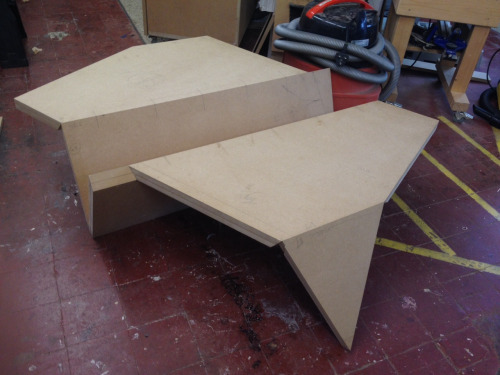 In order for the components to fit this brief there were lots of compound angles to work out. My training on CAD packages including Rhino 3D came in useful. With help from more advanced students on the course I modelled the shape in Rhino and produced a full size mockup in MDF. This process really helped to refine the design as well as to check the methods of construction. The timber was carefully selected, five 4 metre long sequential planks from the same tree. Much more material than I needed, but we are taught to buy at least twice what we need. This means we can make our component selection without compromise, this is essential when making items of the very highest quality. The ash had been kilned dried and had a moisture content of 9.4, well within the acceptable range for furniture makers. The timber was allowed to acclimatise in the workshop, and was dimensioned down to size over a period of two weeks. Mitres seem to have become my joint of choice and there was going to be no change to that in this project. I was able to cut some of the mitres on the Altendorf table saw we have in the workshop. However, the joint at the bottom of the v section required use of the spindle moulder. A scary machine, but once mastered is incredibly flexible. In order to use the machine, each student undertakes a two-day training course. I duly received my training and set about building a jig to hold my work. It took longer to set up the machine, build the jig and run through a test piece than it did to machine my ash, but as all good craftsman say, it’s all about the preparation. In all projects there’s always one exercise or joint that you put off because you know it’s going to be tricky. On this piece it was a hidden mitre connecting the legs to the top. It was necessary and intrinsic to the design. 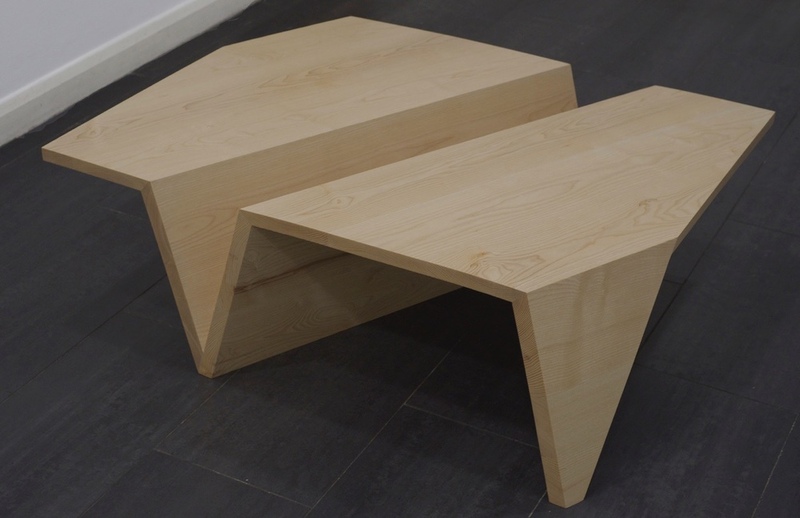 It was the joint that would make or literally break the design aesthetic of the table. I drew on my training as well as patience and quiet determination and built the jig, sharpened my tools and set to work. As is often the case, those things you dread are not always as bad or as tricky as you first thought. 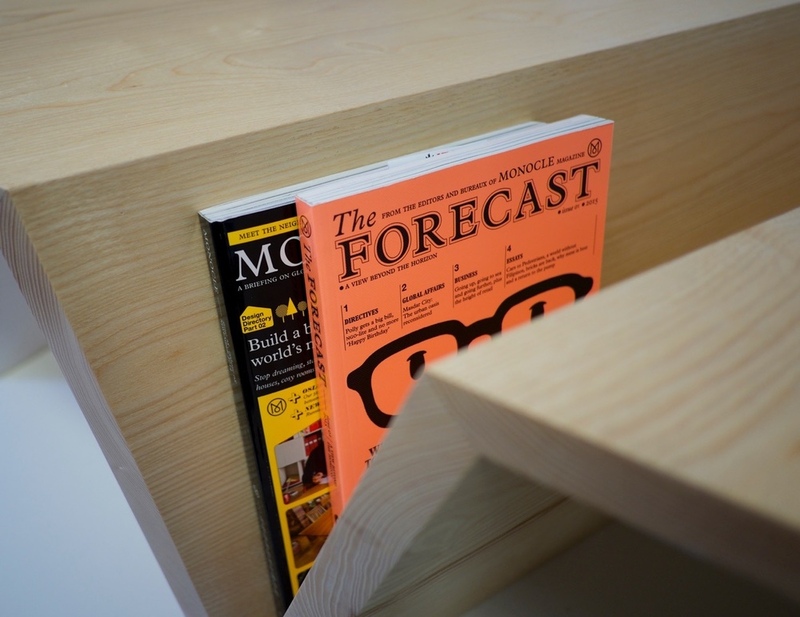 The table was completed on time and taken up to London for a photo-shoot. As furniture makers, photography is incredibly important, poorly lit or staged photo’s do nothing to enhance or showcase your skills. The studio we used was a railway arch in Shoreditch, our professional photographer Tony took some amazing shots. The table looks stunning in this industrial setting, the hardwood floor and distressed brick wall highlight the lines beautifully. I have always loved well designed things. From watches to furniture, 'I am fascinated by the patina of wear; The honesty of real materials, the consider junction between, a steel leg and a leather cushion'. My love affair started some 25 years ago when I stumbled across the work of Robin Day. 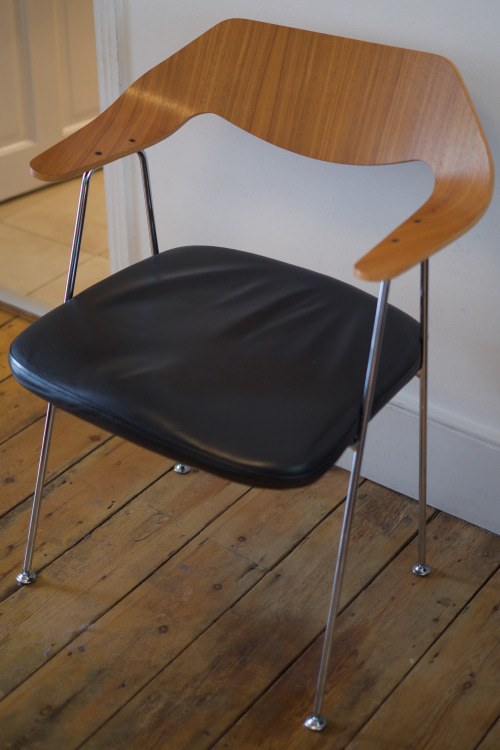 In particular his 675 Chair, designed in 1952. From my point of view, almost everything manufactured today is 'trash'. As consumers we should expect more from the companies that design and make the objects we use, in fact we should demand it. We should all move away from badly designed, badly made and badly resourced products. Let me pose the question like this. 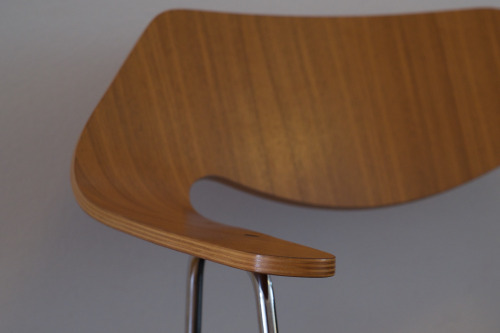 Do you want to spend your hard earned money on a chair that has been designed without care and attention, manufactured in a similar vain using the planet's precious resources, only to throw the chair out after a couple of years? Or would you rather take as much care in selecting the chair and take great pleasure in using it for many years? Marc requires all students to make a box or small cabinet for their first project. A box is the ideal first piece as it showcases all the skills you’ve learnt so far. The ‘downside’ of course is that being such a small item, any small errors or mistakes will be impossible to hide! After much sketching and pondering, I decided to make a pen box that was aimed and designed specifically for MontBlanc pens. I took inspiration from their incredible craftsmanship and design and wanted my box to be as precious and beautiful as their writing instruments. The timber I chose is not only incredibly rare but is native to this country and is completely black in colour. Hamish Low is the country’s expert when it comes to Bog Oak. Not only is he a very talented furniture maker, but he has been perfecting the technique of kiln drying fenland oak for over 25 years. I met him on his farm during the summer of 2014. Marc had taken a group of students to watch the annual bog oak planking. Each summer Hamish hires a mobile saw milling team and they set about cutting up enormous hunks of Oak that have been dug out of low lying fenland areas of the eastern seaboard of the UK. During the initial design phase, my brief was to create drama and excitement about the piece. I wanted to use precious metals, design a unique opening mechanism oh and even include a secret compartment! This box was going to be a perfect companion for any secret agent. Having bought some beautiful rippled bog oak from Hamish, I contrasted this with rippled sycamore for the internal components. Sterling silver was my choice of precious metal as the box needed to look magnificent and masculine. Although Newhaven is a very busy industrial port, it does have a flourishing creative sector full of artists and craftsman. I was put in touch with Mike Shorer, an extremely talented jeweller based very close to the workshop. Mike was commissioned to produce the silver work for the box. He worked to a very precise brief producing exquisite components that add luxury and decadence to the box. Bog oak is extremely dense and quite a challenge to work with. I wanted the box to look monolithic and have the appearance of being hewn from a single piece. The six box components are mitred on all 24 sides. The initial cuts were made on the table saw, but all required shooting by hand, quite tricky considering the size of some of the smaller items. All of my training was put to good use, I learnt huge amounts on this project, not least patience and determination! I needed to be very organised. The schedule of works was followed closely, rubber was machined for the collets, the silver was machined, hallmarked and fitted, the secret compartment created and the single piece of sycamore planed to achieve a piston fit. I had a lot of fun along the way, the six weeks allocated for the making sounds a lot, but in reality it was quite a challenge. The MontBlanc Pen Box PB01 was professionally photographed and received high praise. It has been written about in a woodworking journal and will be on exhibition later this year. From humble beginnings this 5300 year old piece of oak was resurrected from the fens and crafted into a thing of beauty. Tall dark and handsome indeed. I began my journey from a very different place. The world I previously inhabited, the corridors of power in Westminster, the choked up streets of Whitehall and the busy bars surrounding the Mother of Parliament no longer held the excitement they once did. I had long wanted to use my creative talents and actually ‘make’ something, produce something tangible. After much thought and no looking back, I said farewell to my colleagues and my life in the city and relocated to the South coast to study fine furniture making and design with Marc Fish at his robinson house studio. It was a world of discovery, where everything is possible. I enrolled on to the 50 week designer/maker course. The intake is strictly limited and I filled the last place on the May intake. I was joined by 5 other budding furniture makers from various parts of Europe with varying levels of skill and experience. We were all very different, but we each shared the same dream - to design and make bespoke furniture to extremely high standards. From the outset we were all in such a hurry to learn as much as possible. We would get to the studio for 7.30am in order to prepare for the day’s lessons. Those early days were intensive, teaching began at 9am prompt. We covered all the basics starting with tool preparation and sharpening, metal theory and timber technology. I was itching to start work on the first project, but it was a couple of weeks before we even saw our first piece of timber! Marc would structure lessons so that morning sessions were classroom style involving lectures, discussion and demonstrations. After lunch we would get on to the practical lessons anything from sharpening to tool tuning. The days flew past and it wasn’t long before we began our first project. All students make ‘winding sticks’, a little used tool in the workshop but an exercise in precision. The winding sticks are used to check for wind or twist in timber and need to be identical is size and perfectly square. With our newly tuned planes we are able to achieve an extremely high degree of accuracy. So much so, that Marc promises a bottle of Champagne to any student able to produce these pesky little sticks of Maple to within two thousandths of an inch of each other and of course square on all sides too. At one point, Marc was looking at a very expensive trip to the wine merchants, with all students on track to achieve the almost impossible. In the end three of us celebrated at Marc’s expense, a pretty impressive result considering some of us had no previous experience of using hand tools. As the weeks turned into months my confidence grew. 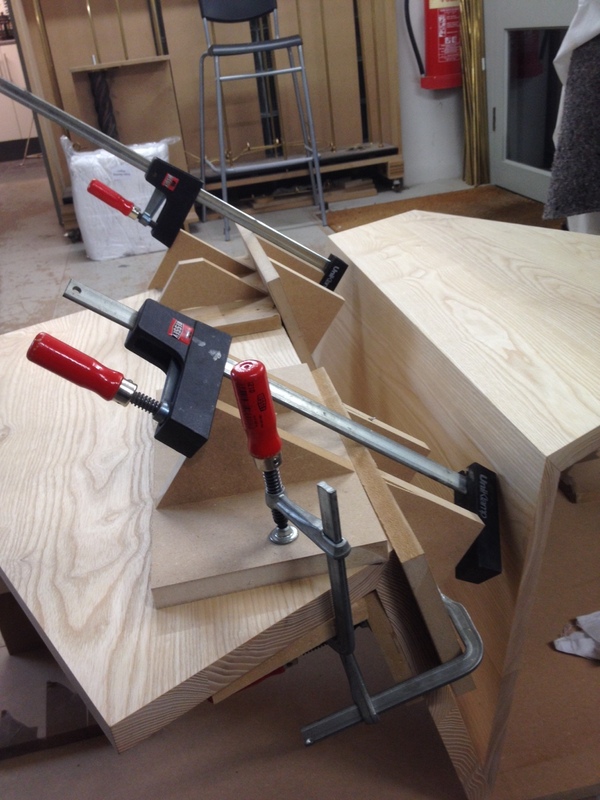 The trips to timber yards, the drawing and painting classes, design discussions and homework sessions all helped to equip me with ‘tools’ I needed to design and make furniture. "Lifting the lid reveals the contrasting ripple sycamore interior where the pens are loaded into perfectly fitting barrels whose silver ferrules hold them like chambered rounds. Tucked into the ‘secret compartment’ behind a sliding door, meanwhile, a pair of spare ink cartridges sits in its profiled slots looking for all the world like something lethal issued to double-O operatives by Q Department."